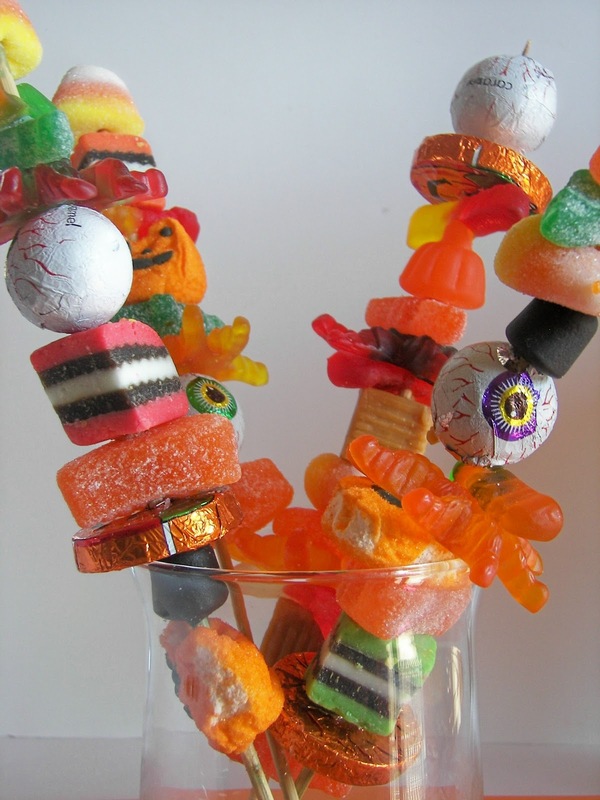 Zoulah was peeking in the October Better Homes and Garden magazine and saw Dylan Lauren, of Dylan's Candy Bar fame, showcasing candy skewers for Halloween. Zoulah, being all about Halloween adapted this idea for Red Couch Readers. No cooking involved, just lots of luscious Halloween candy served on a skewer. The Red Couch family's church held their semi-annual conference this weekend -- they were listening at home. During one of the two hour sessions, the Red Couchers created Halloween candy skewers. Zoula wants to say that she just loves looking at the candy. Zoulah used over 16 kinds of candy; you don't have to use that many. Just pick your favorite Halloween candy. Zoulah wants to show you the skewers the Red Couch children made. Yummmmy! Look at all this candy. Zoulah thinks that candy decorations are the best -- that is, if she can get the Red Couchers to stop eating the candy. Zoulah wants to tell you that you should use the thinner skewers if at all possible; it is much easier to skewer candy with thin skewers. Also, use soft candy, no harder than Dots. 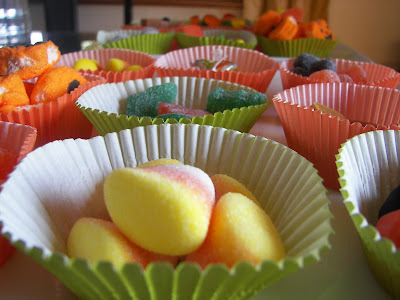 Zoulah says that the favorite candies for skewering were the chocolate eyeballs, the Pumpkin Peeps, the Licorice All Sorts, and the Tarantula Gummies. Of course, Zoulah wants to tell you that she loves all kinds of candy and that whatever is your favorite candy works. Joni, Tell Zoulah that I like her skewers a lot more than the original version in BH&G! Hers turned out just DARLING! Another darling idea! I think Zoulah is a great witch to have around. Does Zoulah do outside jobs? I could promise a cosy, spidery bedroom and a spooky breakfast if she'd just come on over and do up some treats for my house. I just loooove your skewers! So precious! These are really cute. We spent out time during conference making gingerbread houses and walls. Can't wait til we get together to have another MS day. Hope Zoulah is there. She needs to encourage her twin sister Beulah to get out and about. What an adorable idea! 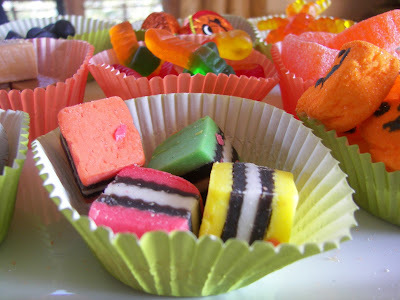 These look like so much fun to make with the kids. LOVE that Witch! These are absolutely wonderful. Your photographs are stunning. I am filing this idea away. Thanks for sharing. Adorable Joni! Allie has planned a party with the cheerleaders to make these for the football players! Totally fabulous!!! I am going to do the Peeps one as a special after school treat for my son this week - he is going to love it :) I appreciate the idea! oh my goodness, how fun! this looks great in terms of display, but would be so fun to make with kids. such a great idea! 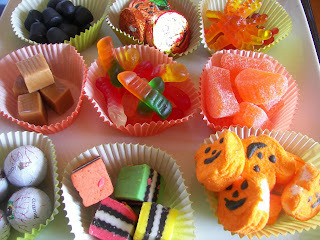 I love candy crafts--and these are made of adorable! Very cute, now I need to grab some candy and skewers for the weekend. Have a fabulous Monday. These are great! There are so many great Halloween candies out now...I love the eyeballs! I'm visiting from Just Something... Have a great week! I'm having people in this weekend (I think) and was trying to decide if I wanted to do a candy bar for only 8 people...I knew there would be to many leftovers. This is my answer! Perfect! Thank you! You continue to amaze. What a fun idea. We just sat and watched conference. I love it! 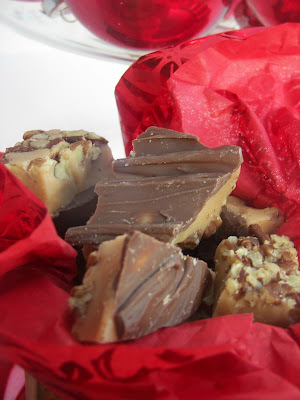 I posted a link on my edible crafts column (ediblecrafts.craftgossip.com). Such wise advice! so cute...what a clever idea! Your skewers turned out so cute. I love them! This is adorable. Coming over from Take a Look Tuesdays. What a fun idea I am going to have to do this with my little men! Thanks for sharing. Those are really fabulous! Love it! Visiting from Sugar Bee. That is a cute and simple idea that even I could do! Thanks for sharing. I'm going to print it for my notebook of blog recipes and ideas right now! My kids are addicted to this site this week. Thanks for all of the great ideas!! so cute! I'm featuring your skewers in a post tomorrow on crazydomestic.com. Feel free to grab our "I was featured" button! What a cute and simple idea, unfortunately we don't like sweet things, lol ! What a cute easy idea to do with the grandkids this weekend! Zoulah has a good eye! And a great idea, too. What a fun idea! I love the eyeballs too. What an adorable treat! I just love these. GREAT party idea!!! 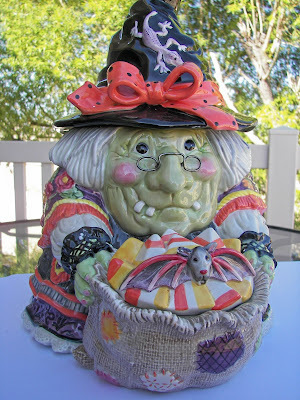 Thanks for linking up another great inspiration to Thrilling Thursday @ Paisley Passions. The candy skewers are SO cool! Thanks for sharing them! YUM! Have a great weekend!se. great idea. I am in love with these candy skewers! How wonderful for a party! I love your witch. I can tell you love Halloween as much as I do. I've been busy with many halloween projects at my house. I'd love for you to stop over. Zoulah! 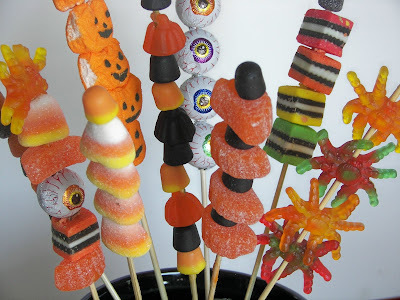 Thanks for the wonderful idea for candy skewers. I've not seen these. 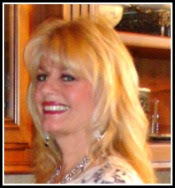 Please tell Joni how much we enjoy your links to Alphabe-Thursday. They are always clever and fun! What a fun and easy idea! Thanks for sharing! such an awesome idea. I LOVE IT! Such a good idea. I never know how to display my halloween candy. Ha! Those are adorable! And look SO yummy! So cute and awesome photos too. I featured this idea on my blog today - love it!